Our 2018 has started with rolling out incremental improvements for creating surveys and managing data. The tweaks are based on feedback from the Maptionnaire community and they’re designed to ensure the service makes your life easier. The priority assessment, a multiple choice question type, is useful for adding participatory budgeting into your questionnaire. Or for any other exercises with a goal to filter out the important aspects of a larger whole. What’s new with this option is that we’ve introduced the possibility to customize what your respondents are dividing (units) and how much you’re offering them (total value). To set up a priority assessment, use the questionnaire editor to add a multiple choice question and choose priority assessment from the drop-down menu. Then enter your categories and click the “settings” tab. In the following menu, you can enter a maximum value (number) into the “Total to divide” box and the units you are working with into the open text box below. 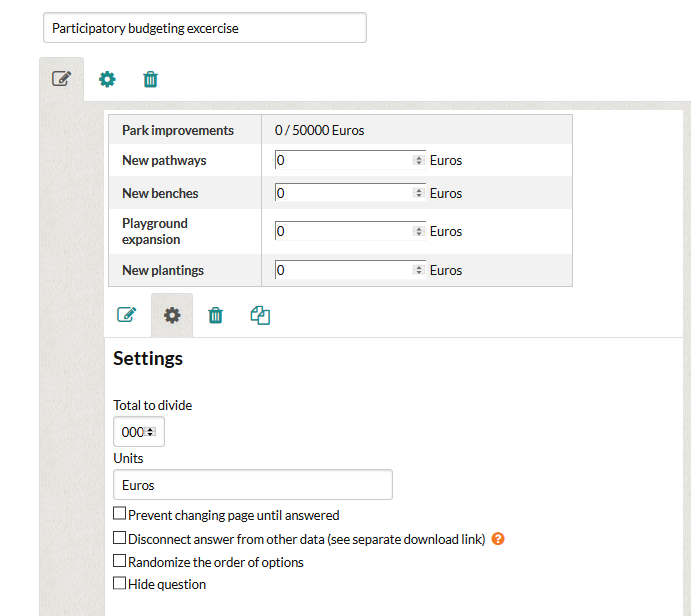 You can now customize your participatory budgeting with units and the total budget. Our improvement to this question type will especially benefit those working with many multiple choice grids in their questionnaires. One such group are researchers. In the editor, you are required to give each grid you make a name (main question) for the sake of ensuring a structured data set. This requirement forces you to add text to the upper left corner of your grid question even when it doesn’t necessarily add any value to the grid or respondent. We’re now giving you the option to hide grid names from respondents. This will help to keep respondents focused on the important part of the grid. Furthermore, questionnaire managers can now name their grids as it makes sense for the data analysis process. This option is enabled under the “settings” tab of your multiple choice grid: just tick the box “Hide the main question”. The word “Feelings” is the main question (or name) of this grid and now you can hide it (right image) to have less clutter in your survey. Exporting your dataset out of Maptionnaire has always been a couple of clicks away. In doing so, the default has been to receive the entire dataset, starting from the period your questionnaire has been made. Unless, of course, you’ve manually deleted any test answers before sending it out to respondents. But now you can do more. We added the possibility to choose the period you’d like to have data from. This means you don’t necessarily have to clean the answers from your testing period, just opt to download data beginning from the day actual respondents have received your survey. Or if you just want to compare answers before and after a certain event, it’s now much easier to do so. Choose the “Date range” option when you want to download data between exact dates. As part of our development process, we always make sure that the new features we bring add value to the participation process and ensure that the end result is gathering of qualitative data. Subscribe to our newsletter for staying up to date about the latest developments! What Does Digitalizing Participation Mean? Enter your email to receive the latest news from Maptionnaire, top picks from our blog, and info about our upcoming events. We won't bother you often. Thank you for subscribing to our newsletter. We promise to not spam your inbox, instead we tend to send them only a couple of times a year. Please check your inbox to confirm the subscription. If you decline we won't track your information when you visit our site. But in order to comply with your preferences, we'll have to use just one tiny cookie so that you're not asked to make this choice again. Anonymous tracking allows us to see how you are using the website without any possibly identifying information. We can then use that data to improve the website in the future. Functional cookies make the website work properly (so that you can navigate around the site, etc.). You can not switch these cookies off but you can tell your browser to not accept cookies at all in the browser's settings. Please note that doing so can seriously affect the usability of our website.